A new concept for the role of the Player Jury Member: In the last 10 years I wittnessed very often compliments of distinguished players praising at highest order the playing qualities and sound of contemporary bows, but returning without even asking the price or showing any desire of owning the highly praised bow. This happened both in the ateliers of the makers, as well as at expositions and competitions. This is of course something all bow makers have experienced themselves, but in my opinion not a big help in a competition. By being in such a prestigious Darling Bow Making Competition as Player Jury Member with the very best quality of today´s possible made bows, in my opinion it is to be seen as an honour. And to be taken serious as a Player Juror it simply needs a mutual commitment. So who do we need as a Juror of Playability? 1. Players who are experienced in trying bows in a short time and thrust their own playing and judging ability. 2. Players who like and support Contemporary Bowmaking by playing and buying contemporary bows. 3. Players who 100% believe that in this Competition they will find such a great playing and desirable bow. 4. Players who realize this opportunity to benefit themselves as well the support for The Contemporary Bow. Players who do not recognize themselves in all required 4 descriptions above are recommended to pursue the more traditional ways and are more than welcome to come to the exhibition for the traditional trial system. 1. Jury Members of Playability choose 2 of their favorite playing bows, indicating 1st and 2nd choice. 2. Jury Members for Playability can only be players which commit their judgment by buying the bow they consider their 1st or 2nd choice as best of the competition. 3. The buying price is € 4000,- for all the competing bows, and goes 100% to the maker. After the playing days are over, the original selling price of the makers are the selling prices again. 4. The bows will be played before the exhibition opens, to avoid strategic decisions by the Jury players. 5. As some dealer/players inquired for being a Playing Jury, it is decided that they will be accepted as Playing Jury Member). If multiple decicions fall on the same bow, the active musician has the first choice. The dealer/player gets the 2nd. (which is not dramatic, as the chance the bow is chosen for commercial reasons and to be sold is significant higher, so not necessarily the biggest need in matching a certain instrument or player). 7. In all other cases of more than 2 Jury members chosing the same bow, the Jury Members will be served in the order of the entrance of their non-refundable Jury Member fee. Date and hour of payment will be written on the sealed envelope. Question nr. 1: What if 2 people like the same bow? If there is a dealer/player who choose the same bow, the mainly musician player gets the first choice, as for a dealer, the bow is more likely to be seen as commercial item to be sold, and not necesserally to be matched to a certain instrument or player. If there are 2 players, it will be drawn who has the first choise, the other will get bow nr. 2 of his choice. Question nr. 2: What if I don´t like any bow? If from the expected ca. 35 violin bows, 15 viola bows and 25 cello bows, made by more than 25 highly decorated makers of today, who are living from their profession since many years, made for a competition to being judged by 5 top makers, with the best wood they can possibly choose, no single bow can fulfill a players demands, it has probably reasons not to be found at the bows. For those players it is strongly advised to switch to the guitar or mandolin, as they don´t need a bow, and are also very enjoyable instruments to play. (Or becoming a dealer is another possibility). Anytime before the trial session starts. Access to the bows is only granted after the funds are handed over. Please be aware that earlier financial transaction could be of decisive meaning if more than one player choose the same bow, as in a standoff situation the earlier payer will be have the first choice. Question nr. 4: If I don´t like any bow, can I get my pre-paid € 4000,- back? This situation will not occur, as players asking this question will not be accepted as a Jury of Playability. (see Profile nr. 3). They are advised to pursue the traditional way of trying bows, with traditional prices, as the opportunity to get access to such quality bows are obviously not recognized and appreciated enough. Some of the competition bows will not be for sale anymore at all after the playing sessions finished. The only possible chance of returning the pre-paid funds is the confirmed order of a guitar, mandolin or any plucked instrument from a contemporary maker for the same amount. (see Answer of Q. nr.2). Question nr.5: When do I get the bow? 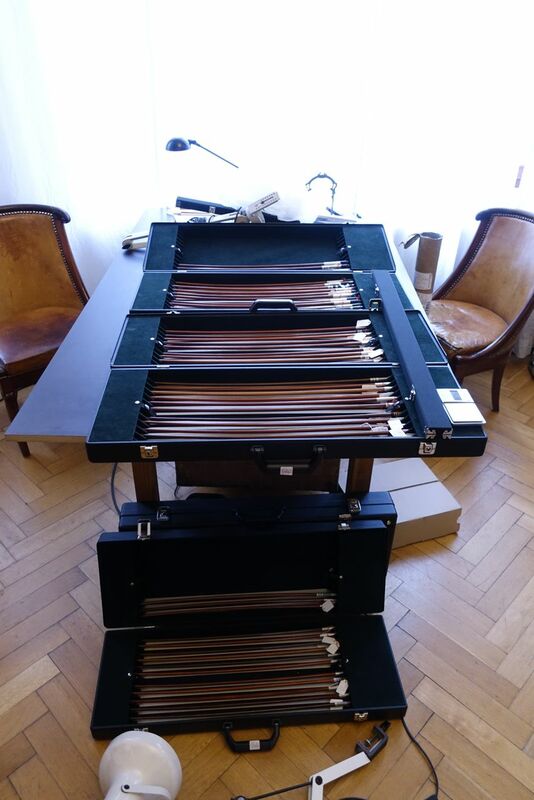 As the bows will be judged for Workmanship after the playing sessions during the Exhibition in Amsterdam, they are not yet stamped. After the Award Ceremony on Saturday evening 7 Mai 2016, the bows have to be stamped. The bow will be delivered, sent or collected, depending on the arrangement of player, maker and Darling Publications. Question. nr. 6: Where are the Playing sessions? On appointment at the premises of Darling Publications in Cologne. Question. nr. 7: What are the dates of the playing sessions? Question. nr. 8: How long are the testing sessions? The time limit of 2 hours is set. But a considerably shorter time is expected, as the players are supposed to be experienced. Question. nr. 9: Can I know beforehand the name of the bow makers who are participating in the competition? No, to prevent strategic decisions of an unbiased “playing” jury. The Playing Jury is supposed to be “unprejudiced“ and has the possibility to be in the “playing” Jury because of playing qualities. Speculative and investment prospects are highly interesting matters, but should not be the main goal for the Playing Jury. From 47 participants 25 are already highly decorated award winners, and as my experienced eye and attentive ear are telling me already that several of the younger makers, competing in this Competition, are already pretty sure to become the next generation of award winners! Beside that I don´t know yet what bows for what instruments will be arriving for the competition, which makes the question not not actually having sense either. Question. nr. 10: Can I know who are the Judges for Workmanship? No, as even myself don´t know that yet. This will be decided on the day the exhibition begins. They will be chosen from the participants of the competition and selected on differences of style, background and experience. So beside that, aren´t we here in a “playing” jury? hope to have answered most questions concerning the Privileges as well as the Commitments of becoming one of the Playing Jury Members.